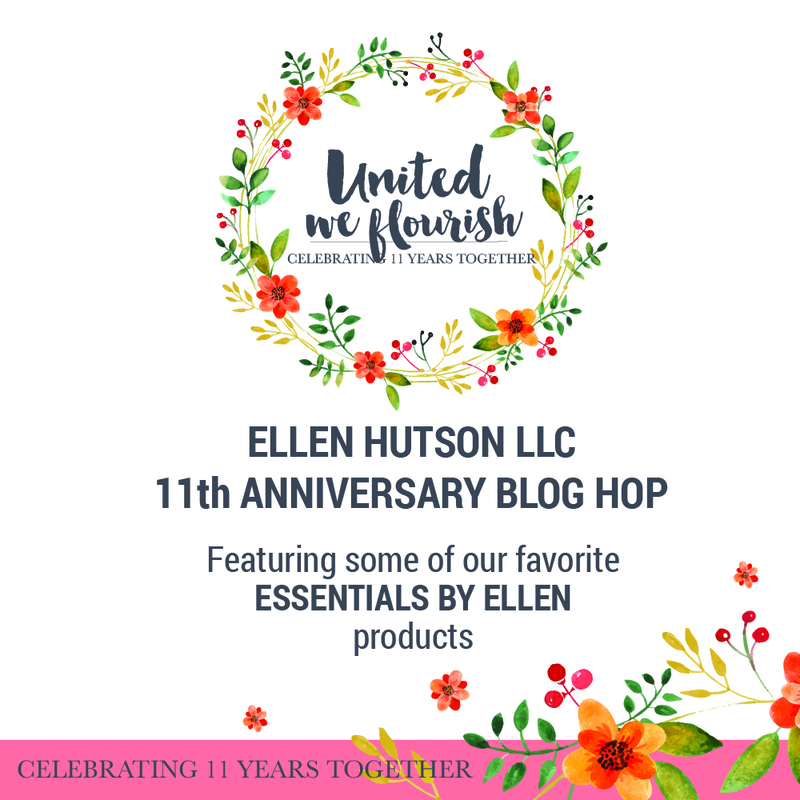 Hello everyone and welcome to the Ellen Hutson birthday blog hop week as we celebrate their 11th anniversary! I’m so excited and honored to join the fun today! You should have arrive here from Sharon Harnist’s blog and will head to LauraJane Head‘s blog once you leave here. I went for a clean and simple design. I started by creating a watercolor background using Distress inks and left it dry completely. Once it was dry, I cut around the rainbow watercolor splatter and adhered it to the front of a top-folded white card base with foam adhesive. I stamped the sentiment the Otterly Awesome set in black ink. I stamped the otters, colored them, cut them and attached them with foam pads to the rainbow background using foam pads too. To finish off the card, I added some enamel dots. Your next stop is LauraJane Head! If you get lost anywhere along the way or encounter any broken links, you can find a list of all the hop participants on the Ellen Hutson blog, The Classroom! ACK! Super cute! Love the colorful background!!! I like what you did with the watercolor background. The white edge really pops. I have never thought of that. Thanks for sharing. That is such a sweet card. 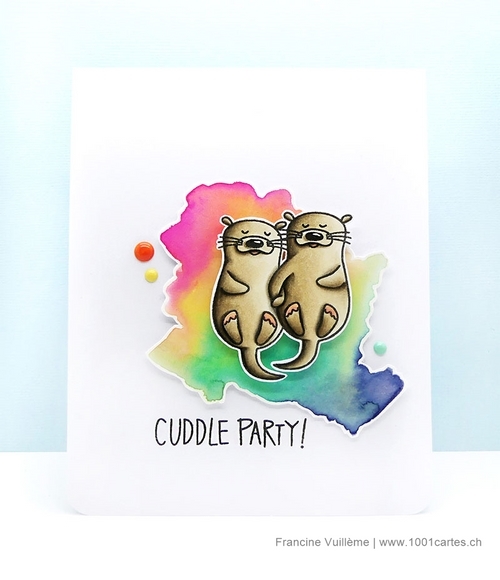 The little otters are adorable and I love the rainbow watercolor background. This one just brought a big smile. Love the otters and really love the way you did the watercolor background. Great job on a cute & sweet card. Darling card! Love the otters! 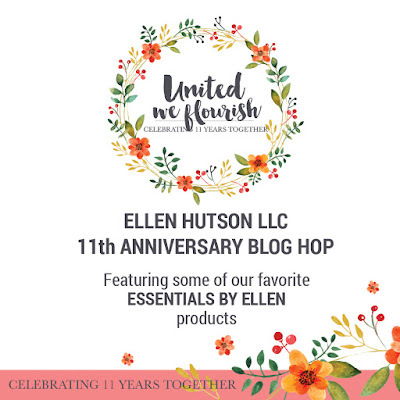 Happy 11th to Ellen Hutson's shop! Brilliant of you to provide those adorable otters with a rainbow pool of water to swim in. Such a lovely design. Such a cute otter card! Love your card! The cut out watercolor background is a wonderful idea! This is so adorable! I love how you "popped up" the watercolor background with the otters. Cute card! Making the watercolor pool like that and popping it up is clever! Awww what a cute scene, love your background! Love this adorable card and design. It's fun and cute! What a fabulous background! I'd've never thought to cut out a random ink background like that and I can't wait to try - so cool!! Love how you colored the sweet otters, too! Very cute!! I love your rainbow watercolor background and it popped up like you did behind the otters. Great design! So sweet and cute. Great idea to cut around your rainbow background and lift it off the base. Looks fab. Very cute card! Like the colorful background. This is one of my favorite stamps. So cute. They found the best piece of ice in the sea. Your card is so "otterly" cute! I really love how you made your background. Love! So LOVE your clever & creative idea! Super cute otter set. Love your distress background. Your water color background is beautiful! Great background to those super cute otters! This is super cute! I love the color and those cute otters!! Aww, such a cute card. Love your water colored background. This is too cute love it! Adding my voice to the others in being otterly charmed by your sweet, cuddling otters! Adorable! Oh, these otters are adorable on their rainbow colored island! Francine, your otter card is so sweet! I love it! So cute! Love the gorgeous background & the adorable otters! Oh my !! How cute is your card !! So cute - love the otters. So cute. I like the colorful background. Very pretty background for these cute others! What a day brightener! So sweet! I like the rainbow background for the wonderfully colored otters. Very creative, bright and so much FUN! What a cute card you have created. Love the watercolor background. Cute otter card! Cuddle time! I Otterly LOVE your card! Thank you. I can't stand how cute this is--love it!!! The otters are so dear. I love how you did your blended background and popped everything up. They look so in love and really like their accented noses. These otters are the best! You put them in a pertfectly lovely colorered setting to show them off! How sweet and cute! The watercolor background is perfect for these little guys! This is one of my favorite cards ever! love the beauty of watercolor mixed with fun, casual images. Cute and adorable. Thanks for the inspiration. Adorable! I love the sentiment! Super cute card. Great idea to cut out the background watercoloring. It really adds to the card. Great shading and love that rainbow to pillow the otters. Love the watercolor background! Very sweet card. Love those sweet otters! Great card. I like that look of cutting around the background you created. I will have to try that. Cute card. Love those otters. in Alaska and they are amazing. So stinking cute and love the splash of color you created for the back drop. I love the rainbow colors you set behind these super adorable otters!! Love your card & love the sentiments in this set!! I just love the otters! I can never make my water color background look so good. Yours looks amazing! Such a cute card. What a creative & beautiful background! Wonderful card! You know...Otters are just cute. Thanks ...this is perfect. 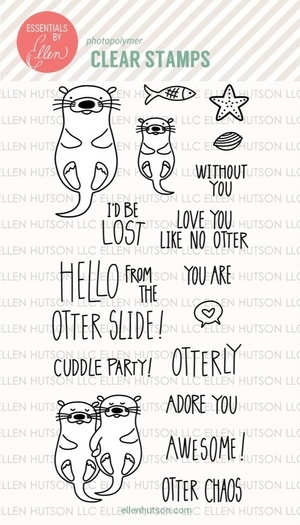 Super cute Otter Card, love this set and your fussy cut watercolor background! Such a cute card! I like the rainbow background behind those adorable otters! Oh my Gosh....this is the cutest thing I've seen. Thank you for sharing. Oh my gosh! I love this card...especially your background. Love the cut out ink splatter and how you popped it up. Your card is cute too. What a fun and sweet card! I love the coloring. Great stamp set. Love the rainbow water for your super-cute otters. Awww! How cute and cuddly! So adorable. The watercolor background is wonderful. Smile producing card, it's adorable with the otters on a rainbow background. Super cute card! I love how you did the background. Thanks for this great idea! This is so adorable and I love the simple background with the wonderful colors! Great job! 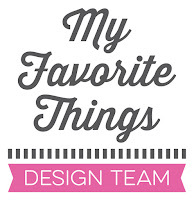 I went out of order and saved your post for last, because whenever I see your name listed, I know I'm going to LOVE your use of color! You didn't disappoint on this clean and adorable card! I like how you added interest by cutting out your colored background and popping it up! Great coloring of the otters too! Thanks for sharing! These otters are one of the most adorable visions in all of nature! Glad to see them in a stamp set. Perfect background for those cute little guys! So cute! I love how you cut out the watercolor piece and used it as a layer. Very clean and refreshing. What a fun set! Wow I just love your rainbow water splatter for this adorable card. Sweet card! I really like how you made the watercolor layer. That is brilliant! I love the rainbow watercolor background, and how you made it just a small 3D piece instead of a whole flat panel! So simple, yet makes such a difference -- and a statement! Love the 3D watercolor background! Makes everything stand out so much more! Very cute! I love your idea of cutting out the watercolor background. Wow, stunning in its simplicity. The love idea to cut out the background to make it 3D. The otters are adorable. What an adorable cute card! Just adorable! I love that you cut out the watercolor BG and then popped it up. It adds just a little something extra. Cute card ! Lovely otter-couple on a GREAT background ! Your background is stunning. I always love an otter, and they are so cute. Great job! These cute otters are real pals. Neat coloring. Oh My Goodness I love this card. Set is adorable. Otterly Awesome! Thanks for the background technique! Terrific! This card is fabulous! I love the little bit of white around the background. These otters are too cute! Love the watercolor background piece. Thank you for the inspiration.